The all first class trains were attractive to business travellers, with their luxurious air conditioned comfort and extravagant cuisine. Trip times were the fastest possible and with the exception of a break of gauge on Spanish routes, very short frontier halts were made possible by conducting customs procedures en route. The Netherlands, Switzerland, France, West Germany, Belgium, Italy, and Spain were all members of the consortium, and each provided dedicated train consists, most famous are the DB VT11 and the Dutch/Swiss DE/RAm TEE trainsets. 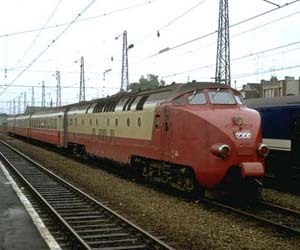 The primary function of the Dutch/Swiss TEE was providing the once daily Edelweiß service, each way between Amsterdam & Zurich via Basle, Luxembourg and Brussells. These trainsets were also seen sharing the Amsterdam to Paris 'Etoile du Nord' and 'Ile de France' services; the 'Brabant' between Brussels and Paris; the Paris and Lausanne 'l'Arbarete'; and the 'Bavaria' between Munich & Zurich. At a time when electrification of the Edelweiß route was incomplete, and the existing sections were of different current systems it was considered there was no alternative to diesel power for this TEE. If the electrification could have been completed, developements in multi-system technology hadn't sufficiently evolved to traverse the 4 different current systems involved; 1500V DC in the Netherlands; 3000V DC in Belgium; 15000V 16 2/3 Hz AC in Switzerland, and 25000V 50Hz AC in France. In 1957, 5 train sets were delivered, DE-1001 to DE-1003 to Nederlandse Spoorwagen (NS) and RAm 501 & 502 to Schweizerische Bundesbahnen (SBB). The power cars were built by Werkspoor in the Netherlands; 2 1000 HP 16 cylinder diesels powered a generator that delivered current to four traction motors. A further 350 HP engine provided on-board power supply; and at that time, adoption of a 1BO-BO1 wheel arrangement was necessary to achieve a suitable axle load of 20t. Coach stock was Swiss built, Schweizerishe Industrie-Gesellschaft drew on experience gained from the construction of the 'Leichtstahl-I' series coaches. The consist included a passenger car with 9 compartments each seating 6, a restaurant car and an open coach fitted with remote cab and streamlining to match the power car. The inclusion of a duplicate cab eliminated the necessity for time consuming shunt manouevres; the consists were semi-permanently coupled and treated as self propelled vehicles. 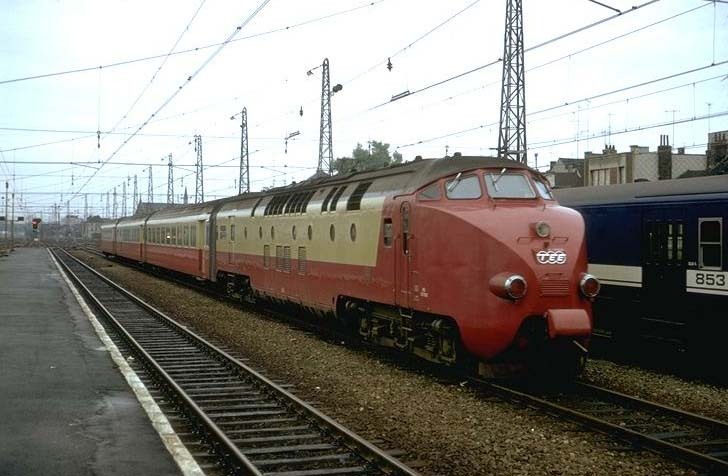 With the spread of electrification in Europe and advances in multi system electric train technology; with the exception of 501, which had been destroyed in an accident, the DE TEE1/RAm trainsets were withdrawn in 1974. The Ontario Northland Railway took posession of all the remaining vehicles in 1976, for use on the 'Northlander' Timmins-Toronto express service. Initially the trainsets worked the ONR service in their original configuration, though it was ruled due to concerns about passenger safety and snow covered rails, that the power coach would always lead, thus eliminating their effectiveness as push-pull consists. Maintenance difficulties and a sensitivity to the harsh Canadian winters led to the final withdrawl of the power cars by 1980. The services continued to operate powered by 4 EMD FP7s which were overhauled and fitted with head end power units to provide electricity for the coaches. The TEE trainsets survived in their adapted configuration until withdrawn in 1992. A Swiss co-operative TEE Classics is working to return a TEE set to Switzerland and to original condition for use on Orient Express trains. Project "RAm TEE I - Welcome Home" has aquired 8 cars and substantial repairs have been undertaken. In 1998, 5 cars returned to Sweden after more than 20 years in Canada. Promising as this sounds, the project is far from complete, with all the original power cars now scrapped. TEE Classics plans to build a new power car, based on an ex BR class 50 diesel electric.